Vee Eee Technologies Solution Pvt Ltd is a Chennai based product Development Company. We Provide Industrial Solution for ERP Package, Bill Pro ,Stock Pro, Online SMS system, SIS and etc. We also constitute a Professional Training Institute which formed with a Vision to bridge the gap between the Institute and the corporate world. This is very niche training and looks at complete 360 degree training for consultants with Software and hardware background at the entry level. 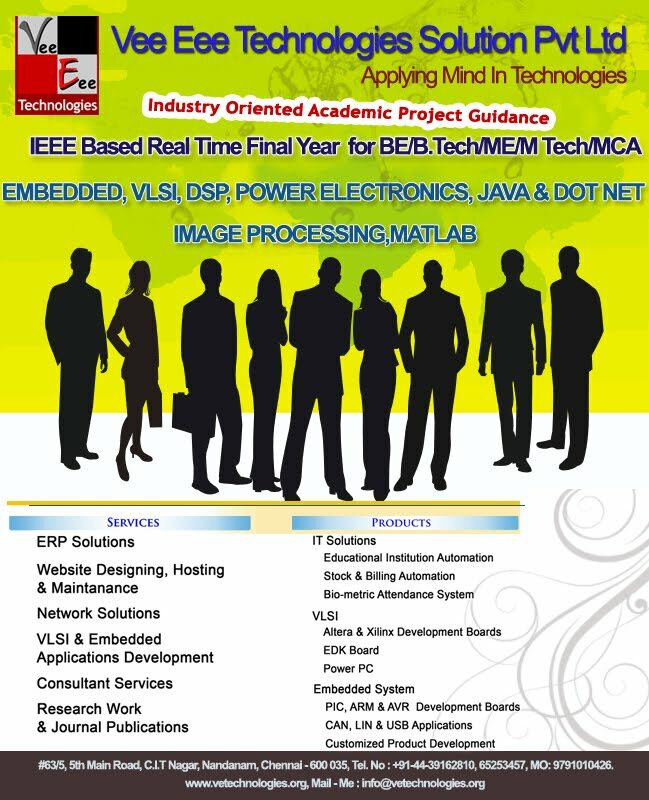 Vee Eee Technologies Solution Pvt Ltd is also offers Projects for Final year engineering students with Industrial Training, where the effect of Real time work environment and we Provide solution for All Department SOFTWARE,EMBEDDED,VLSI,DSP,POWER ELECTRONICS,DOTNET,JAVA You need not to search more. Now days, engineering students from lesser known institutes who churn out brilliant ideas through their final-year projects can rub shoulders with their counterparts from coveted establishments. "In the absence of a platform the excellent works done by engineering students are not recognized. While students of bigger institutes hog the lime light, while small town engineering students who also bring out great works have no opportunity of getting recognition of their work,". , "There are around six lakh technology students who spend at least six months in their final year for doing a project every year. And yet, nobody knows the fate of these projects. We are targeting to document at least half a million project works of the final year engineering students in the website. We have more already around 600 projects till now. #8/25, 1st Floor, Kambar Street,Near Hotel Le-Royal Meridien,Guindy Kathipara,Chennai - 600 016. 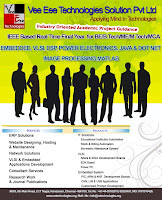 Vee Eee Technologies is a trusted leader in providing IT, Embedded, VLSI solutions to Industries,Shops, Schools and Colleges. So what makes Vee Eee Technologies unique? Our people, our culture, and the way we work with our customers. Since the company’s inception in 2004, Vee Eee Technologies has fostered an environment that promotes striving higher in everything we do. Our employees are fully prepared to meet the challenges you face, and are dedicated to working until the job is done and your mission-critical needs are met. Our staff is approachable, accessible, and dependable. We don’t wait for our customers to call—we reach out to talk with them on a regular basis to ensure complete satisfaction. And we don’t make you wait either. Our project managers are empowered to make decisions to support your needs, no matter when or where. Vee Eee Technologies is dedicated to not only meeting customer expectations, but exceeding them.